Affordable and universal, what's the catch? Having multiple displays improves productivity tremendously (as well as your gaming capabilities); that remains mostly the remit of desktop PCs despite the growing popularity of laptops. Belgium-based startup Sliden'Joy promises to change that with a clever solution that will go live next week. Tech retailer Media Markt (the German equivalent of Currys/PCWorld) has already backed the project. Dual-display laptops like the GScreen, The Onkyo DX or the Kohjinsha DZ-series, have been plagued by poor performance or too many compromises. Others like the Lenovo ThinkVision USB monitor or the AOC E1659 have proven to be either too slow (since they used USB 2.0) or too big. 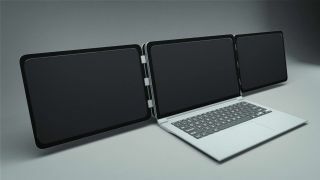 Sliden'Joy allows users to add either one or two 13-inch, 15-inch or 17-inch displays to their laptops (with other display sizes coming) for as little as 199 Euros (about £145, $225, AU$280). The cheapest dual-monitor setup adds another 100 Euros (about £72, $112, AU$ 141). All the displays are powered by a single USB 3.0, are platform agnostic (work with PC or Mac), have a 180 degrees rotating aluminium hinge (allowing it to fold neatly) and, most importantly, are full HD. The team behind the project promises to have several finishes, including leather and wood, based on what we can see on the company's website.